Home / Blog / One is never alone with a book…. One is never alone with a book…. After 7 months I have finally gone back to work. This is not an insignificant event. The significance, however, lies not in the fact of the work itself…..but rather an old habit that has been resuscitated. I am reading again. This may not seem a news-worthy event to those who do not know me…..but for those who do there is much rejoicing. I have been adrift without my books. When I first had the accident I couldn’t hold a book open….this status continued for a couple of months and through a combination of despondency and my library having to be packed away because of a leaking roof my addiction, my habit was lost. But…..one simply cannot commute without a book…..and so this week, as I returned to work, it was obvious I would have to shove a book into my bag……as important, if not more so, as including a packed lunch. As I opened that brand new book (oh, the smell of a new book…..almost as good as the smell of an old book) and read the first few lines I was immediately lo st to another world. The pushing and shoving of all the other sweaty commuters disappeared, the hiss and thump, thump from inefficient headphones disappeared, the anticipatory worry for the day ahead disappeared…… Slightly over an hour later, as I walked through the squares of Bloomsbury, thinking about Virginia Woolf and not thinking about work at all, it struck me how alike my books and my garden are in importance to me and the effect they have on me. When I am in the garden I am transported to another world…..a world that is free of worry, that is calm and peaceful, that is present. When I read I am transported….to wherever the author (and my own imagination) want to take me. In the garden I can choose to be whoever I want to be….there is no-one to judge me. When I read I can choose to be one of the characters…..I can be nostalgic for a memory that isn’t my own. 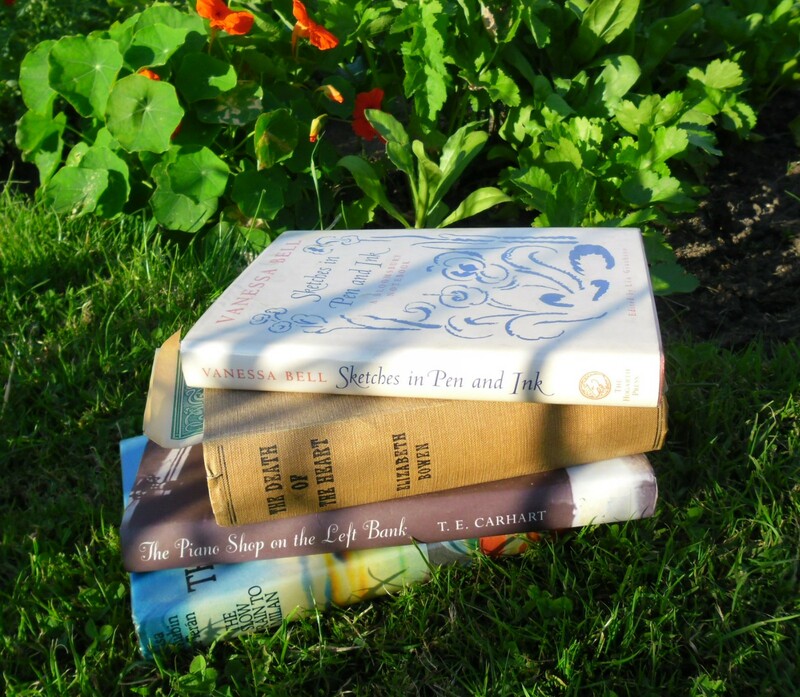 The garden and the books have the power to evoke memories long since put away…. A few days ago, tending to the herbs, I ran my fingers through the rosemary bush. There wasn’t a soul about and I closed my eyes for a few seconds…….the smell hurled me back in time…..I was in my little apartment in Paris. I lived on the second floor of a grand but rather decaying Haussmann on the Left Bank…….my bathroom window opened onto the inner courtyard which was planted with rosemary and lavender…. I would lie in that bath tub for (almost) hours with the smells of the plants drifting up….and the sounds of my neighbours; the de Ganay children being shoo’ed by Mdm Gautier’s broom (a harridan of a concierge! ), the arguing of the young couple upstairs who I never saw but with whom I felt intimately acquainted……and the cellist on the other side of the courtyard whose playing could reduce me to tears in seconds… All of this came back in a flash from tickling my plant……..and so it is with books. Transported. My addictions. My escapes. It is true that I am ‘never alone with a book’…..and I am never alone in the garden with my thoughts and dreams and memories. Smell your plants, close your eyes……see where it takes you. We may not all be novelists…..but we create our gardens….and open ourselves up to a nostalgia we can’t quite put our finger on……..let’s see where it takes us……. Oh, Vivi, how I can so relate! I have, it is safe to say, in excess of 10K books of a variety of genres in my little library, and I know them all. To be sure, I can’t remember my own address at times, but show me a book and I can tell you if I have a copy of it, and if so, what the book is about and pretty much on what exact shelf or pile the book is located in my home. I simply cannot imagine a world without books. And I am so happy you are able to adventure among the pages of your books once again.